Today I am having fun reviewing and giving away, not 1, not 2 but 3 vocabulary apps from Communication APPtitude to one lucky winner. InferCabulary™ and InferCabulary 3 are vocabulary apps for middle school and high school students, which teach them definitions through concrete explanation and visual support (photos). 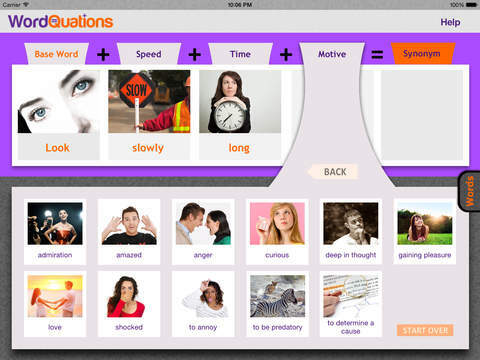 A third app WordQuations™ assists the students with learning the meanings of subtle verb synonyms through visual support. The app has 3 options: Teach, Definition Games, and Word Games. In “Teach” the student sees a word on the screen (arranged in alphabetical order) as well as 5 photos which describe the word’s synonymous meanings in context (below). A pull out menu to the left (contains all the 100 words in case you want to teach/arrange the words in a different order). There’s also a “more” button where students can learn more information about each word. In “Definitions Games” there are 4 options: “Novice”, “Speed”, “Sudden Death”, and “3 Lives” of varying level of complexity. In “Games” mode the student gets 2 photos, each one with a specific caption (“She is the best at her job”; “I did it! I finished my degree!”) and 5 definitions describing the targeted word. The student must choose the best definition matching the captions under the two photos in order to win. If they make the right choice, they go on to the next word. If they make the wrong choice, it will add another picture for a clue. The app contains 100 Tier II vocabulary words (in alphabetical order) from middle school literature such as Lowry’s ‘Number the Stars’, Tolkein’s ‘The Hobbit’, etc. You can find the list of words HERE. Similar to InferCabulary, InferCabulary 3 is set up in the exactly the same way with the exception that it contains 100 Tier II vocabulary words from high school level books such as Steinbeck’s ‘Of Mice and Men’ and Lee’s ‘To Kill a Mockingbird’. You can find the list of words HERE. Now let’s talk about WordQuations™. Here you begin by choosing a base word: Drink, Eat, Look, Put, Sit, Talk, Think, Touch, Understand, Walk or Write. Next choose a speed. Then, choose a heaviness, volume or intensity. After that, choose a motive or em0tion the click on the synonym – there may be one or more than one. Finally read the definition and play the video to see the actors demonstrating the synonym. I liked all three vocabulary apps because they use great visuals and clear explanations. The one thing I wish the developer did differently for the InferCabulary apps is to arrange the words based on relationships or semantic clusters to create a scheme vs. arranging them in alphabetical order (Marzano & Marzano, 1988). You can find these apps in the iTunes stores (link to all 3 HERE), or thanks to developer’s generosity you can enter my Rafflecopter Giveaway for a chance to win a bundled version of all 3 apps.